In what follows is a brief history of the LAU School of Engineering, which originated as a dual degree program started in 1978 in collaboration with a number of American institutions. The program evolved into a School of Engineering and Architecture in 1995, with three departments offering bachelor’s degree programs in Engineering and Architecture. 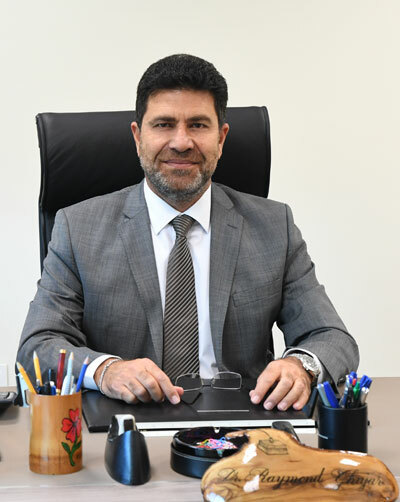 The formal establishment of the school was led by founding Dean Abdallah Sfeir and supported by department chairs and faculty. At that time, the Department of Architecture and Design was chaired by Dr. Rachid Chamoun, the Department of Civil Engineering was chaired by Dr. Camille Issa, and the Department of Electrical, Computer and Industrial Engineering was chaired by Dr. George E. Nasr. In the fall of 2009, due to its growth in size and stature, the School of Engineering and Architecture developed into two separate schools: School of Engineering and School of Architecture and Design. We recognize here the individuals who assumed the leadership position of dean on interim or permanent bases throughout the school’s history and present: Dr. Abdallah Sfeir (Oct. 1996 -Jun. 2003), Dr. Elie Badr (Acting Dean Jun. 2003-Sep. 2005), Dr. George E. Nasr (Dean Oct. 2006 - Aug. 2018, Acting Dean Oct. 2005-Sep. 2006) and Dr. Raymond Ghajar (Interim Dean since Sep. 2018). Engineering education at LAU started in 1978 through what was known as the Dual Degree Program, offered in cooperation with institutions in the United States, including Arizona State University, Boston University, Clemson University, Columbia University, Georgia Institute of Technology, Iowa State University, Kansas State University, The University of Kentucky, The University of the Pacific, Polytechnic Institute of New York, The University of Texas, Texas Tech University, The University of Tulsa, Virginia Tech, and Washington University. Students enrolled in this program attended LAU until the junior year, after which they would transfer to one of the cooperating institutions to complete their degrees. Graduates of the Dual Degree Program received a Bachelor of Science in Engineering from the US institution and a Bachelor in General Science from LAU. During the time spent at LAU, students received basic instruction in the liberal arts as well as in the core science and math courses required for a professional degree in engineering. Due to the popularity of the Dual Degree Program, the growing demand for engineering education, and the growing need for technical expertise in the post-civil war era in Lebanon, the LAU Board of Overseers and Trustees decided in August 1993 to start offering Bachelor of Engineering programs at the Byblos campus. Initially four programs were offered in civil, computer, electrical and industrial engineering. Six years later, the mechanical engineering program was added. Curricula were developed according to the US style of education and taking into consideration the requirements set by the Lebanese Order of Engineers and Lebanese law. The initial four programs were approved by the LAU Board of Overseers and Trustees in 1994. The Lebanese government approved the engineering and architecture programs offered by LAU on July 24, 1996 (government decree no. 9278, art. 5). At the time, the school included engineering and architecture programs. But it has come a long way since its inception in 1993. In the fall of 2009, the former School of Engineering and Architecture became two schools, one focusing exclusively on engineering, and one housing all architecture and design-related majors. The Engineering Accreditation Commission (EAC) of ABET, http://www.abet.org , decided in its Summer Meeting held July 14-16, 2011 in Arlington, Virginia to accredit the Bachelor of Engineering degree programs at LAU ( Civil Engineering, Computer Engineering, Electrical Engineering, Industrial Engineering, and Mechanical Engineering). This accreditation action extends retroactively from October 1, 2009. July 1996: The late Prime Minister Rafic Hariri announces Government recognition of LAU’s new professional programs, among them the engineering degrees, at commencement.